50 x Cruze Cutter warehouse safety knives. Designed with the packaging operative in mind, the cruze cutter safety knife has been designed to be more comfortable to use, reduce operator fatigue and increase productivity. The cruze cutter's ergonomic design allows it to sit comfortably in the palm of your hand. Its wide, textured, high grip body, smooth finger tips and thumb rest combine to create the most comfortable to use safety knife currently on the market. 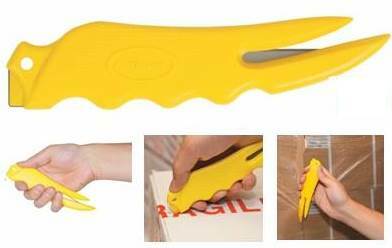 Its curved profile pallet film cutter and oversized box cutter make light work of unpacking tasks, even in the toughest of industrial environments. - Wider body profile allows the knife to sit perfectly in the palm of the hand, increasing grip. - Contains a thumb rest for leading comfort and control. An excellent and cost effective solution for the warehouse/industrial workplace, while staying fully in line with health & safety requirements.